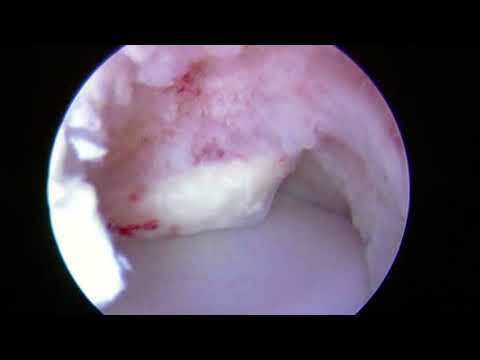 Osteochondritis Dissecans of the elbow, more commonly known as Capitellar OCD, involves a loss of blood supply to part of the cartilage within the elbow joint. When this cartilage ceases to perform its shock absorption duties, the elbow joint can become stiff, inflamed, and generally painful. Your Capitellum is: A smooth, round, knob on the end of the humerus joined with the radius bone to form a hinge, with a shape similar to a knob and a cup. Articular cartilage is: A slick, smooth material that protects bone ends from friction when they rub together. Articular cartilage is soft enough to act as a shock absorber. The capitellum endures tremendous force with activities, like throwing a baseball or gymnastics. The repetitive force impacts a location of bone that has relatively weak blood supply. This causes the bone to weaken, crack, and without proper blood flow, not heal. Genetics play a role in determining who develops capitellar OCD. If a crack develops in the weakened capitellar bone, it may begin to separate, and chip away. If necessary, Dr. Ahmad may request an MRI so he may better estimate the size of the affected area and determine the stability of the bone and cartilage. If you are experiencing intense elbow pain and stiffness, you may have Capitellar OCD —do not continue using your elbow. Instead seek medical attention to determine the severity of your injury. Dr. Ahmad recommends surgery for more advanced stages of Capitellar OCD. Arthroscopic treatment is used to safely remove loose pieces of bone and cartilage. Perforations are made into the bone to allow stem cells from bone marrow to heal the Capitellar OCD defects. The Graft method is used when the damage is extensive. It entails placing a graft into the defective area, and is capable of achieving better results than debridement and drilling. The graft is cylindrical plug of bone and cartilage that is placed into the defect. 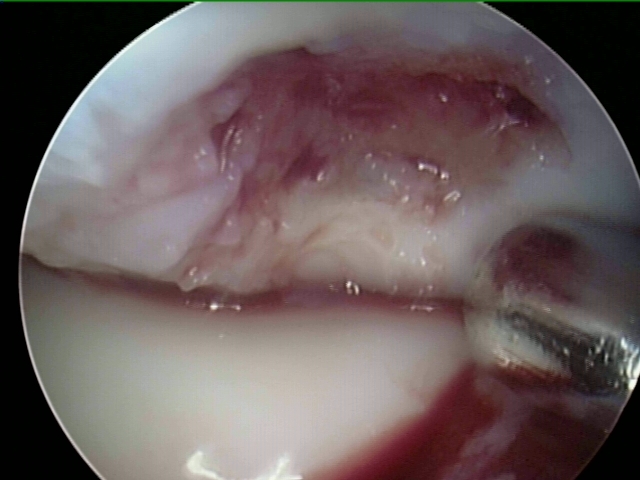 The graft will restore the normal function of the original articular cartilage. 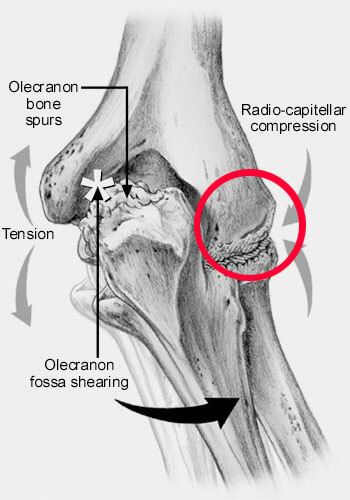 Red circle indicates that capitellum making contact with the radius bone. This figure also orients the next few scope images. The red circle is what the camera is visualizing. A pin is used to make perforations in bone. Perforations in the bone allow marrow elements to gain access to the defect and stimulate healing. Dr. Ahmad is nationally recognized expert in capitellar OCD surgery has designed and studied the optimal methods to surgical repair capitellar OCD lesion. His undergraduate training in mechanical engineering has allowed him to research the optimal methods of treatment. Dr. Ahmad has performed several hundred elbow arthroscopies and capitellar OCD treatment in all types of patients from elite pitchers, middle school golfers, and Olympic development gymnasts. Listed below is Dr. Ahmad’s scholarly articles and research published to help capitellar OCD treatment. Gancarczyk SM, Makhni EC, Lombardi JM, Popkin CA, Ahmad CS. 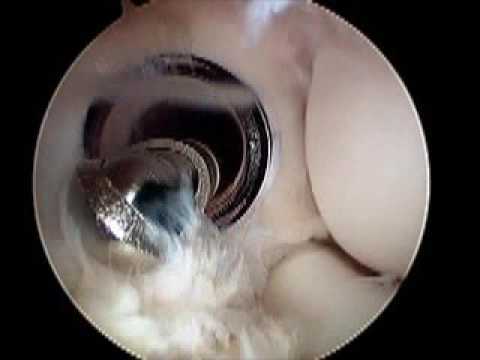 Arthroscopic Articular Reconstruction of Capitellar Osteochondral Defects. Am J Sports Med. 2015 Oct;43(10):2452-8. doi: 10.1177/0363546515594448. Epub 2015 Aug 13. Iyengar JJ, Grantham, Byrum, Ahmad CS: The Curveball as a Risk Factor for Injury: A Systematic Review, Sports Health, Sports Health. 2015 Jan;7(1):19-26. 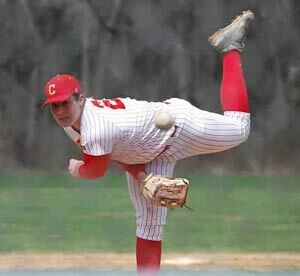 Redler LH, Watling JP, Ahmad CS: Physical Examination of the Throwing Athlete's Elbow. American Journal of Orthopedics 2015 Jan;44(1):13-8. Makhni EC, Morrow ZS, Luchetti TJ, Mishra-Kalyani PS, Gualtieri AP, Lee RW, Ahmad CS: Arm Pain in Youth Baseball Players: A Survey of Healthy Players. Am J Sports Med. 2015 Jan; 43(1) 41-6. Churchill RW, Munoz J, Ahmad CS, Osteochondritis dissecans of the elbow. Current Reviews in Musculoskeletal Medicine, 2016 Apr 28. AOSSM Annual Meeting, IC 402, The Baseball Thrower: What Can Non-Surgeons Teach Us?, Michael T. Freehill MD, Thomas F. Walter, Jeff Strahm ATC, Matt Hobbs, Kevin E. Wilk PT, DPT, Christopher S. Ahmad MD, Colorado Springs, CO, July 2016. AOSSM Annual Meeting, Moderator, Throwing Elbow, Orlando, FL, July 2015. 20th Annual Robert K. Kerlan, M.D. Memorial Lecture, Distinguished Lecturer, Adolescent Throwing Injuries, October 13-14, 2016, Los Angeles, CA. AAOS/POSNA Webinar: Elbow Injuries in the Adolescent Throwing Athlete, “UCL Injuries in Adolescent Pitchers,” June 2016.